Luxury to please visitors with deep pockets and scenery to astound the eye and warm the soul--that's Seychelles in a nutshell. The coastal areas boast a number of upscale beach resorts, with the fine sands and bright blue sea drawing visitors from distant corners of the world. The matriarchal culture that predominates in most households around the archipelago represents a fascinating cultural quirk to learn about during holidays in Seychelles, while the tropical rhythms of the local Creole folk music set the pace of everyday life. Praslin Island: Home to a World Heritage-listed natural reserve, the island offers a blend of terrific beaches and lush jungle areas filled with colorful birds and endemic trees. Mahe Island: The largest island in the archipelago is packed with modern resorts and urban cafes and bars, as well as other amenities you'll need to enjoy a Seychelles holiday. La Digue Island: The secluded island of La Digue remains largely undeveloped, featuring untouched nature and wild beaches with pink granite rocks and stunning views. Sainte Anne Island: If you're seeking a tropical getaway, head straight to this island, where tall palms fringing pretty beaches provide a shade for tourists and turtles. Silhouette Island: The third largest island in the archipelago has something for everyone, including top-notch resorts and clubs, as well as gardens and parks perfect for getting to know the lush nature of Seychelles. Victoria: The capital of the archipelago sits on the northeast side of Mahe and offers a sprinkling of historical sites and museums between lush green spaces and modern buildings. Beau Vallon: This town offers all the picturesque beauty of top Seychelles destinations without the hassle of large crowds--the area is known for beaches offering access to coral reefs perfect for snorkeling and diving. Anse Lazio: The curving shore of this white-sand beach seems to stretch to infinity--great snorkeling opportunities make it a top Seychelles tourist attraction. Anse Source D'Argent: With granite rock formations sticking from its snow-white sand and water, this beach provides the perfect setting for a day of snorkeling, swimming, and sunbathing. Vallee de Mai Nature Reserve: Listed on the World Heritage List, the park grounds offer pleasant hikes on trails surrounded by native vegetation and wildlife. Curieuse Island: Untouched nature flourishes on this tiny landmass in the Indian Ocean, where lush mangrove forests shelter rare species of tortoises and parrots. Grand Anse: The longest beach on La Digue appeals to tourists with its wild and remote setting. 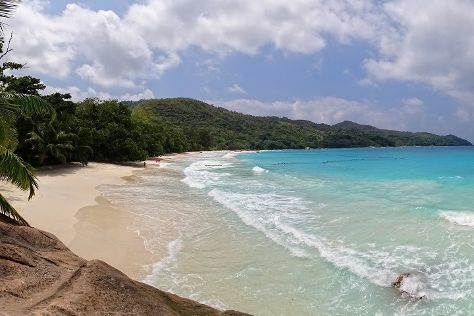 Anse Georgette: Add this sandy beach to your Seychelles itinerary to enjoy a day of sunshine in your very own slice of paradise. Victoria Market: This bustling market full of spices, fresh produce, and all kinds of locally made products is an ideal destination for foodies, as well as tourists hunting for unique souvenirs. Clock Tower: Modeled after the Little Ben in London, this local landmark isn't just a replica--it's also a monument with its own history standing at the heart of the capital. Seychelles National Botanical Gardens: This tropical jungle on the outskirts of Victoria shelters endemic plants and undisturbed wildlife hiding in the palm and fruit trees. Anse Coco Beach: The clear and shallow water of this beach allows visitors to see a range of marine life without using any special diving or snorkeling equipment. The mild climate and lush landscape of the archipelago create the perfect conditions for a peaceful family holiday in Seychelles. Make the most of it by choosing one island as a base and exploring from there. The largest island, Mahe has something for everyone, featuring both modern cities and smaller towns ideal for a more serene vacation. La Digue Island offers the peace and quiet often wanted during a family holiday, but the seclusion of the island can be a problem for visitors with little kids. Praslin Island works as a great alternative that's easier to reach and packed with tourist attractions and resorts. As diving is one of the main tourist attractions in Seychelles, diving centers for both kids and adults are available across the archipelago. If your kids are too young for diving, snorkeling at any of the sandy beaches is just as fun. Head out to places like Anse Georgette and Anse Source D'Argent to play volleyball, build sandcastles, and splash around in the cool, clear water. If you'd prefer not to get wet, Teddy's Glass Bottom Boat and other boat tours will show you what's under the sea without the hassle of diving or snorkeling. Domaine de Val des Pres - Craft Village showcases the traditions and heritage of the Creole culture on the islands--the village offers daily workshops designed to teach visitors about the archipelago's history and Creole lifestyle, architecture, and crafts. To blend adventure with education, head to Seychelles Natural History Museum, featuring a range of exhibits on several topics, as well as some kid-appealing dioramas. Most hotels cater to families, providing babysitting services and kids clubs, as well as activities geared at teenagers. Avoid the temptation to spend all your time on a single beach--boat trips around the archipelago appeal to kids and grownups and can add an element of adventure to any Seychelles holiday. Be sure to add a few nature reserves to your Seychelles itinerary--getting to know giant tortoises and other native wildlife will thrill the kids (and you). Baby products may not be readily available everywhere, so if you're planning to spend most of your time away from big urban centers, bring your own favorites. The Republic of Seychelles is an archipelago of over a hundred islands, so it doesn't come as a surprise that fish plays a prominent part in the country's daily diet. Thanks to the country's location in the Indian Ocean, the local cuisine is a blend of influences from Europe, Africa, and Asia. Expect many dishes with distinctive spices, like ginger, lemongrass, tamarind, and coriander. If you don't like heavily spiced food, you can always take a break from Seychelles sightseeing and grab some fresh fruit or a simple fish meal from a street vendor. Fish is cooked in several ways--usually steamed, grilled, baked, smoked, or cooked in banana leaves. When you get tired of seafood, try some chicken curries with rice. Follow that up with some "ladob," a dessert made with ripe plantains and sweet potatoes and boiled in coconut milk with sugar, nutmeg, and vanilla. Many foodies don't consider their gastronomic tour of Seychelles complete until they taste some shark chutney--made of boiled shark meat, cooked with lime and bilimbi juice. Everyone looking for retail therapy on a Seychelles holiday goes to the city of Victoria, home to both shopping malls and smaller stores. Victoria Market remains one of the best places for souvenir hunters. It's also a great place to see how the locals shop and purchase some fresh seafood. If you're in need of some gifts for the folks back home, consider buying sea shell or pearl jewelry, straw hats, or some woodcarvings or paintings by local artists. Remember that protected items like "coco-de-mer" (a nut from trees native to the islands) requires a special export license. Avoid dark streets in unfamiliar urban areas, and don't visit remote beaches alone. Bring a friend or explore with a guided tour if you're unsure about safety in a particular section of the archipelago. Swimwear is for the beach only--and the resort swimming pool, of course. If you're going out to shop, dine, or explore cultural attractions, dress appropriately for each venue. Respect the islands' natural wonders during your Seychelles tour by avoiding any form of littering or disturbing the wildlife. Seychelles International Carnival in February is probably one of the best annual events you can attend on Mahe Island. It's three days of float parades and other special programs that highlight the various cultures that have helped shape this part of the world. A must for visitors of Mahe, La Digue Island, or Praslin Island, Creole Festival is a six-day event in October. It pays homage to everything Creole, including arts, crafts, dance, music, and cuisine. Other celebrations held throughout the year include Christian festivals, public holidays (Independence Day on June 29), and events to promote underwater conservation. Most residents speak English, Creole, or French. You'll have little trouble communicating with just English or French, but a few simple phrases in Creole will help a little and earn you lots of respect. The country enjoys a hot and humid climate with average yearly temperature of 29 C (84 F). The heat is usually mitigated by cool sea breezes, especially pleasant when you're worshipping the sun on one of the archipelago's beaches. Trade winds bring cool and dry weather in July and August, possibly the best time for a holiday in Seychelles. This is also the height of the tourist season, when you should be ready for big crowds and high prices. Airplane and helicopter flights provide a quick way to get from one island to another. You can also travel to most islands by ferry or boat tour. It's a good idea to book tickets in advance. You can rent a car on Praslin and Mahe, but if you'd rather avoid testing your skills in left-hand traffic, consider taking public buses from one destination to another. Buses are available throughout the day and run on most bigger roads, but don't always observe tight schedules. Taxis work for short journeys and long day trips. Taxi prices for non-residents on longer trips sometimes exceed the cost of renting a small vehicle for the day, a consideration you should keep in mind if you're planning a budget-friendly Seychelles holiday. You'll find that most service providers include an extra charge of 5-10 percent, so tipping is not obligatory--a small reward for a job well done will be appreciated nevertheless.